I’ve been thinking about writing about pseudoscience and alternative therapies in the 2e world for some time, but worried about offending the usually well-meaning people providing such services and the often desperate families who choose to believe in them. But I’ve decided that in the current climate of fake facts it’s important to take a stand on the side of science. I understand why alternative therapies can be appealing. Most are non-invasive, do not involve medication, and can sound logical intuitively. One hears anecdotes about how they changed a child's life. Someone you trust and who seems to care may be recommending it. I get it. And I’ve been there myself as a parent, prepared to try anything and everything that had even a remote possibility of helping my child. But I wasted a lot of valuable time, energy, and money doing so. I hope you won't make the same mistake. So I'll be writing a blog every two weeks in a series called: Myth Busters: Alternative Therapies for 2e Learners. I’ll start with Vision Therapy. I have to say it up-front. I’m astonished by how many people still think vision therapy can cure dyslexia. It simply can’t. Let’s approach this logically from the perspective of where the breakdowns are cognitively in dyslexia. Dyslexia involves weaknesses in one or all of three brain processes: phonological processing, rapid naming, and orthographic processing. There is a great deal of evidence that the main mechanism is usually phonological, namely a basic defect in segmenting and manipulating the phoneme constituents of speech. This has nothing to do with vision. There is evidence (my PhD thesis was in this area) that rapid naming speed can be involved, as the dyslexic brain often has difficulty performing tasks requiring processing of brief stimuli in rapid temporal (time) succession. Again, this has nothing to do with vision. It has to do with timing. Orthographic processing is the formation of visual long-term memory representations of letters, letter patterns, and sequences of letters that serve to map spatially the temporal sequence of phonemes within words. In effect, it’s memorizing what letters and strings of letters look like (for example “ing”), and being able to identify them quickly and efficiently in a word. This does have to do with vision. But it’s a higher-level function. Figuring out what a word says is an iterative, interactive process drawing simultaneously on phonological, rapid naming, orthographic, and additional processes (e.g. word meanings or semantics). It involves higher level cortical functions. It occurs in the brain after visual signals are transmitted from the eyes. We know this from functional MRI's of children reading. Vision therapy addresses lower level ocular function. Its directed at improving visual acuity, eye tracking, ocular alignment, convergence, and other issues. For example, a series of convergence exercises may be recommended to treat convergence insufficiency, a condition in which the eyes are inefficient at working together when looking at nearby objects. This condition causes one eye to turn outward instead of inward with the other eye creating double or blurred vision. It affects between 0.1 and 5% of the population and is most common at high school or college age, when there is an increased demand for near work, and early middle age, when the use of bifocals leads to decreased accommodative convergence. Symptoms include eye strain and blurry vision. A younger child can have convergence insufficiency, and might complain of eye strain or blurry vision. Blurry vision would certainly make reading hard. But ocular function problems like this should not be confused with dyslexia. When I took my dyslexic son to a vision therapist I was told he required 6-12 months of twice-weekly therapy for eye tracking due to frequency of eye saccades. Saccades are eye movements between two or more fixation points, for example backtracking and jumping ahead while reading. I later learned that a tendency toward frequent saccades is a symptom of, not a cause of dyslexia. When a dyslexic reader is having trouble decoding words, their eyes tend to go back and forth trying to figure things out more often than a non-dyslexic reader. So what my son needed was to learn how to read, not how to control his eye movements. It is possible for a child to have both dyslexia and a lower-level ocular defect. But children with dyslexia are no more likely than any other child to have an ocular motor deficit. To automatically assume that a dyslexic child has an ocular motor deficit is a fallacy. And to assume that vision therapy can treat dyslexia is a fallacy too. The child who has dyslexia needs dyslexia remediation. 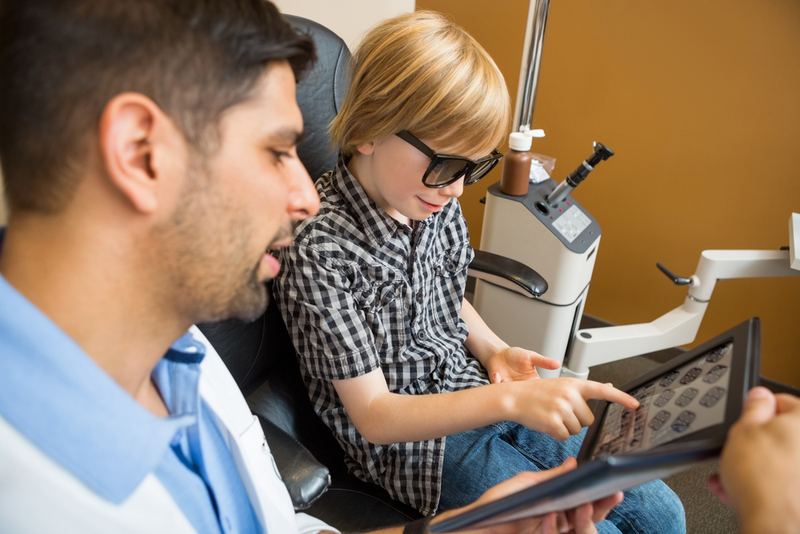 The child who has both dyslexia and an ocular motor defect may benefit from vision therapy as well as proper remediation of his or her dyslexia. In that case I'd recommend doing dyslexia remediation first, then checking to see if the ocular motor defect is still there. But please don't rely on vision therapy alone. The strength of expert opinion against vision therapy for dyslexia is remarkably strong. My ophthalmologist has a binder in his waiting room full of articles refuting claims that vision therapy helps with dyslexia, ADHD, and other behavioral disorders. Key professional organizations have spoken out, issuing policy statements urging their members not to recommend it. The American Academy of Ophthalmology, the American Academy of Pediatrics, and the American Association for Pediatric Ophthalmology have issued joint statements, reaffirmed in 2014. Referring to dyslexia and ADHD, they state: “Scientific evidence does not support the efficacy of eye exercises, behavioral vision therapy, or special tinted filters or lenses for improving the long-term educational performance in these complex pediatric neurocognitive conditions. Diagnostic and treatment approaches that lack scientific evidence of efficacy, including eye exercises, behavioral vision therapy, or special tinted filters or lenses, are not endorsed and should not be recommended.” Even the professional association serving most of the optometrists who perform vision therapy, the American Optometric Association, has come out with the statement that: “vision therapy does not directly treat learning disabilities or dyslexia.” This is very clear-cut. The preponderance of evidence and the consensus of experts point in the same direction. Vision therapy cannot cure dyslexia. I urge parents to prioritize evidence-based dyslexia remediation over vision therapy when deciding on treatments for their children.